An extremely well presented and much loved three bedroom family home situated in a very popular and convenient location. The accommodation offers a spacious kitchen/family room with direct access out to the attractive rear garden, good size sitting room, dining room/study and a good size attic room. SITUATION: The property is situated in an extremely convenient location giving easy access to local junior and senior schooling and the popular Wolfe Recreational Ground. Crowborough town centre is approximately three quarters of a mile away where there are a good range of shopping facilities and mainline rail service at Jarvis Brook with trains to London in about one hour. Local sporting facilities include Crowborough Leisure centre, which houses a large swimming pool, Golf clubs at both Boars Head and Beacon and Crowborough Tennis & Squash club. The larger spa town of Royal Tunbridge Wells is about 8 miles distance, whilst the coast at both Brighton and Eastbourne can be reached within one hour's drive. 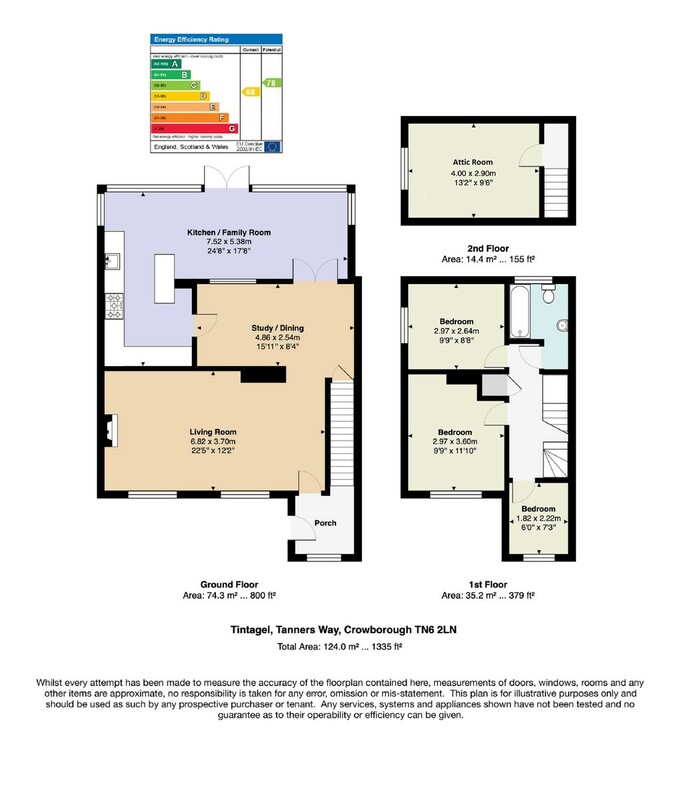 FAMILY ROOM: Continuation of the kitchen units and wooden work surfaces, inset double sink with chrome mixer tap, tile effect laminate floor, radiator, double glazed windows and patio doors overlooking the rear garden. Space for large dining table and chairs, three wall lights. BEDROOM: Double glazed window to front, power points, space for wardrobes. BEDROOM: A double room with double glazed window to side with tiled windowsill, power points. BEDROOM: Double glazed window to front with tiled windowsill, power points, wall mounted storage heater (not tested). MODERN FAMILY BATHROOM: Fitted with a suite comprising of pedestal wash hand basin, low level wc, enclosed panelled bath with tiled surround and shower attachment. Obscure double glazed windows to rear, radiator, tile effect laminate flooring. ATTIC ROOM: Double glazed window to side, eaves storage to either side of room. OUTSIDE FRONT: The property is approached via a tarmac driveway with space for several vehicles with an area to the side laid mainly to lawn with flower beds and various shrubs. Access to the rear garden via side passageway. The landscaped rear garden has a slabbed patio area leading to an area laid to lawn. The bottom end of the garden is a large area laid with pebbles, vegetable patches and stepping stones leading to a large timber workshop with light and power and double glazed windows. The garden is enclosed by new fencing.